Minor League Baseball has arrived in Charles County. The Southern Maryland Blue Crabs are now the fourth minor league ballteam to launch in Maryland over the last 15 years. 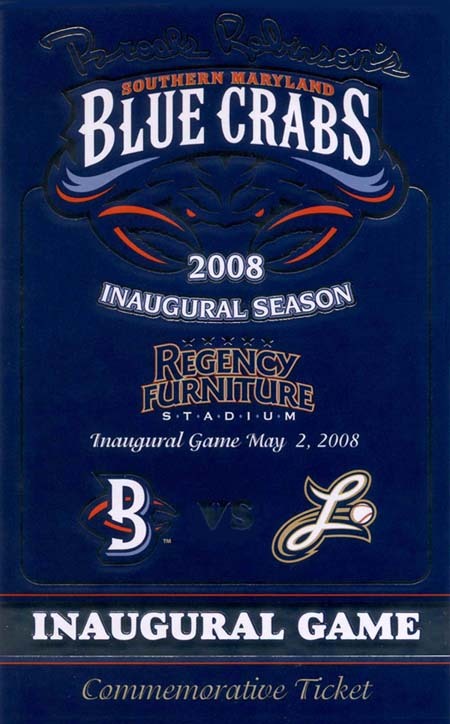 The late afternoon pageantry of the Crustacean Nation Sensation was a gramslam with the fans as the Blue Crabs successfully defeated the Lancaster Barnstormers in their inaugural ballgame on Friday, May 2, 2008. The red ribbon cutting ceremony at Regency Furniture Stadium was officiated as eager baseball fans stood in the queue. Charles County Commissioner Gary Hodge addressed the huddled spectators standing outside the main stadium gates. Hodge eventually presented Orioles Baseball Hall of Famer Brooks Robinson with a framed Charles County Seal. Robinson is a celebrity partner in the Blue Crabs franchise. The Smithereens, originating from New Jersey, provided live entertainment to the Southern Maryland audience prior to the launch of the Blue Crabs home season in Waldorf. The quartet performed an abbreviated set situated on a mobile flatbed, parked at second base. Only six songs long, they certainly pack a rock'n roll punch in their energetic performance. The Field ceremonies preceding the ballgame were choreographed for maximum impact. The Blue Crabs raced out onto the green turf serenaded by the Chesapeake Caledonian Pipes and Drums, a Scottish bagpiping band. Several local baseball little league teams from the surrounding counties were assembled along the baselines. Members of Maryland's military were honored. Students from the 25-member McDonough High School Chamber Choir sang the National Anthem. The inaugural ballgame finally got underway as the first pitch crossed homeplate at 7:54 pm. The Lancaster Barnstormers were leading in the game until the Blue Crabs scored their first home run in the sixth inning. From there on out, the Blue Crabs went on to score two more runs by the eighth inning, securing the lead and eventually winning their premiere ballgame at home in Waldorf. The game concluded victoriously at 10:10 pm. To cap off a stupendous Opening Day extravaganza at their new facility, the Blue Crabs treated their new fans both young and old alike to a spectacular Fireworks display. Vivid colors burst upon the indigo sky, streaking rainbows of lighted stars accompanied by thunderous booms that announced a new sports season had begun in Waldorf. Bar none, the facility amenities at Regency Furniture Stadium may have set a new standard to be expected at al future Minor League venues built henceforth. To begin with, there is an expansive lawn area that reaches around the perimeter of the outfield. Ballfans can leisurely relax on lawn chairs, blankets or a single row of bleachers that stretch across the backfield seating section. An enclosed childrens playground and picnic area complete with sawdust acts as a major distraction for the little legs. For the inexpensive cost of admission, parents and their children can escape the tension of the innings action and hang out in this crowded outdoor arcade. An added attraction underneath the leftfield ramp is a unique Bumper Boats flotilla. For those who prefer exclusivity, the stadium features a raised deck section under a tent that offers an open buffet during the ballgame.